This bourbon apple pie is filled with flavor and texture. Chopped toasted pecans and raisins make it interesting, and the bourbon gives it "spirit." If you don't have bourbon, you may use whiskey. If you don't want to use alcohol, combine 2 tablespoons of vanilla extract with 6 tablespoons of water. Bourbon soaked raisins and toasted pecans go into this delicious spiced apple pie. 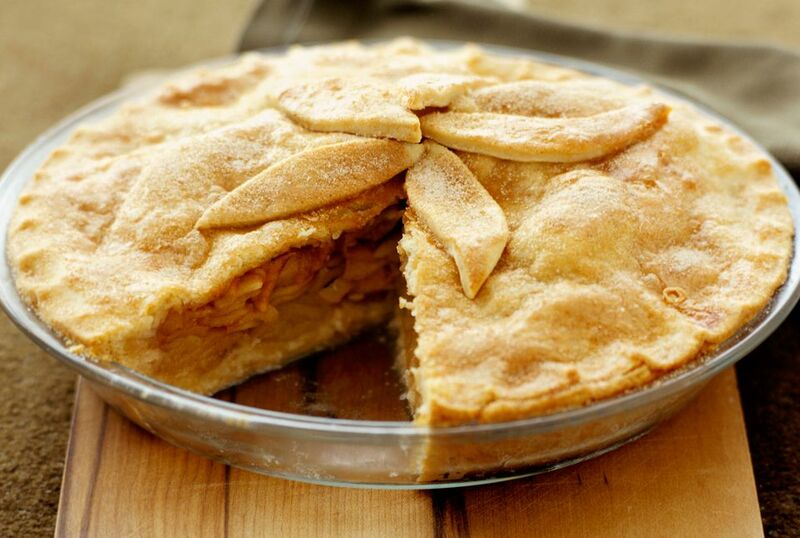 This is a rich and flavorful 2-crust apple pie, perfect for a very special dinner or holiday dessert. Combine raisins and bourbon; let soak for 1 1/2 to 2 hours. Peel apples; cut into 1/2-inch slices. Arrange apple slices in a steamer over boiling water. Cover and steam 10 minutes, or until apple slices are tender. Combine 3/4 cup sugar, the flour, cinnamon, salt, and nutmeg in a large bowl; add apple slices, raisin mixture, and pecans, stirring well to combine. Fit 1 pie crust into a 9-inch pie plate; brush preserves over the pastry. Spoon apple filling mixture into pie crust. Roll remaining pie crust out; cut out several leaf shapes, marking veins with a sharp knife. Arrange the pastry leaves over apple filling mixture; brush leaves with buttermilk or evaporated milk, and sprinkle pie with the remaining 1 tablespoon sugar. Bake at 450 F on lower rack of oven for 15 minutes. Shield edges of pie with strips of aluminum foil to prevent over-browning. Reduce oven temperature to 350 F and bake 30 to 35 minutes longer. *To toast nuts, spread out in a single layer on a baking sheet. Toast in a 350 F oven, stirring occasionally, for 10 to 15 minutes. Or, toast in an ungreased skillet over medium heat, stirring, until golden brown and aromatic.